Pubblicato in: Cielo e Terra: fisica e astronomia, un antico legame. Saggi di storia della fisica e dell’astronomia e dell’archeoastronomia. Aracne Editrice, Ariccia (RM), giugno 2014, pp. 323-339, ISBN 978-88-548-7206-6. 6 alcuni simboli del dio Mithra (il toro, il leone, la brocca ed il serpente) che paiono rispecchiare le configurazioni tropicali del IV-III millennio a. C. quando gli equinozi di primavera e d'autunno erano, rispettivamente, nel Toro e nello Scorpione ed i solstizi d'estate e d'inverno rispettivamente nel Leone e nell'Acquario, considerando che la brocca ben rappresenta quest'ultimo e che il serpente può ben rappresentare l'Ophiucus. In ogni caso, uno scorpione compare in molte raffigurazioni di Mithra, il quale, essendo già presente nell'Avesta (la cui composizione si fa risalire a non dopo il X-IX secolo a. C.) come ipòstasi di Ahura Mazda, pare proprio risalire alla religione aria politeista pre-zoroastriana. Tutti questi indizi mostrano che le civiltà ebraica e mesopotamica sapevano che nel IV-III millennio i punti equinoziali e solstiziali si trovavano in costellazioni diverse da quelle del II-I millennio. Particolare enfasi sembra fosse data alla presenza del punto vernale in Toro. Si mostra poi come l'errore di misura della velocità precessionale sia da attribuire non ad Ipparco ma a Tolomeo, il quale pare avere commesso anche altri errori. Si propone in conclusione la tesi che la precessione degli equinozi fosse ben nota, probabilmente nel mondo mesopotamico da cui gli Ebrei avrebbero attinto, assai prima di Ipparco e che a quest'ultimo sia stata attribuita la scoperta per una serie di errori di Tolomeo. It is a common idea that Hypparcus discovered the aequinoctial precession in the 2nd century b. C. and that it was unknown before him. But we have some evidences that it was known some millennia ago. Many authors are convinced about it by now. In this paper I will debate five evidences about the knowledge of the aequinoctial precession before Hipparcus and besides I will show as Hypparcus's ideas were probably distorted by Ptolemy. It was debated already by Maria Giulia Amadasi Guzzi and Vittorio Castellani (†) (Amadasi & Castellani 2005; 2006), therefore I shall limit myself to expound their conclusions. The bronze-made Foroughi cup was built during the first half of the first millennium b. C. by Aramaic masters. It reproduces a starry sky with some recognizable constellations and heavenly bodies. Its origin and its age are provided by seven engraved inscriptions typical of Aramaic culture VIII-VII century b. C..
About the several heavenly constellations and stars groups (Ursa Major and Minor, Pleiades, Corona Borealis, a Man With A Stick In His Right Hand, a Monkey, some comets and some rayed stars, the Moon, the Sun and perhaps the visible planets), the interesting ones for our purpose are the four ones put at the tips of a cross, two of them clearly reproducing Taurus and Leo; the third one seeming to be the Scorpio and the fourth one can no more be identified because of another engraving upon it. The fact that the Leo is in the engraving reproducing the Sun, the Moon is around the no-more-identifiable-constellation and Taurus and Scorpio are not associated to any heavenly body, induced the authors to think that Leo and the no-more-identifiable-constellation symbolizes, respectively, summer and winter solstices. Maybe consequently that these are the tropical representations of the summer solstice in Leo and the aequinoxes in Taurus and in Scorpio. If this is true, the fourth no-more-identifiable-constellation should be Aquarius. But this is the astronomical situation of the IV-III millennium b. C., while during the 1st millennium b. C. the four tropical constellations were Aries (spring aequinox), Cancer (summer solstice), Libra (autumn aequinox) and Capricorn (winter solstice). Therefore it is right to deduce that the Foroughi Cup does not show the heavenly situation of the age in which it was made but the previous one, one or two millennia before when the spring aequinox was in Taurus, the summer solstice in Leo, the autumn aequinox in Scorpio and the winter solstice in Aquarius. The respective position of the two Bears (Ursa Major and Ursa Minor), at two opposite sides of the center in the cup, reproduces the polar representation at the end of the II millenium b.C. when the North Heavenly Pole was in Draco, between Ursa Major ans Ursa Minor.Therefore the two authors deduce that the Forughi Cup is "...the first graphic representation of a past heaven in which the effects of the precession are shown". The Qumran fragment 4Q318 (the acronym means that this fragment is the number 318 and was found into the cave number 4 of Qumran) is called brontologion - from the two Greek words brontos = thunder and logos = wisdom - because it teaches how to foretell the future from thunders. But it is an annual calendar too and it describes to which Zodiacal sign every day of every month of the year belongs. Therefore, it is an astrological calendar (R.H.Eisenman and M. Wise 2006). Just because 4Q318 was written in 2nd - 1st century b. C., we would expect rightly that this Zodiac calendar begins with the Aries sign or, more properly,with the Pisces sign, because the vernal point passed from Aries to Pisces just during that period: at the end of the 1st century b. C. the Aries age finished and the Pisces age began (Bianchi and Codebò 2005; Bianchi, Codebò, Veneziano 2005, 2009, c.s.1). it follows evidently that the 1st and 2nd days of the 1st month Nisan are assigned to Taurus. Therefore, we have a text of the end of the 1st millennium b.C. which shows a Zodiacal configuration of the 4th - 3rd millennium b. C.
By the reconstruction of the succession of the generations before a certain date of a well-known event (i. e. the destruction of Jerusalem by Babilonian army in 587-586 b. C. or Cyrus's Liberation Edict in 538-537 b.C., it is possible to date the main ancient events of the Old Testament. Of course, this time-reconstruction does not correspond necessarily to the reality, but it is only a Biblical chronology. Many reconstructions - ancient, for instance, the Anglican Bishop James Ussher's one (J. Usserius 1722) and modern, for instance, Jehova's Witnesses' one - exist and closely show a similar chronology. The big difference is between the Masoretic text and the Greek text. The Masoretic Text - and Vulgata Text with it - dates the world Creation around 4000 b. C., while the Greek text dates it around 5500 b. C. The differences are mainly in the ages of the antediluvian patriarches (list # 1). The first known Jewish ancient reconstruction of the age of Creation was written in Seder Olam Rabbah, II century A.D. aged (Encyclopaedia Judaica 1971-1972). According to it, the world was created 3828 years before the destruction of the second Jerusalem temple, i.e. 3761 b. C. But Seder Olam Rabbah includes two errors: it dates back the Roman destruction of the second Jerusalem temple to 68 A.D. and compressed the length of the Persian rule to thirtyfour years! But, as a matter of fact, Romans destroyed the second temple of Jerusalem in 70 A.D. and the Persian rule lasted from the conquest of Babylon in 539 b. C. by Cyrus to the Gaugamela battle, when Alexander the Great destroyed the Persian Empire in 331 b. C., i.e. two-hundred-eight years. Therefore, the Seder Olam Rabbah date of the world creation must be back-dated 2 + 208 = 210 years: i.e. 3761 + 210 = 3971 b. C., in accordance with the date calculated by J. Ussher, Jehova's Witnesses and some Fathers of the Church: about 4000 b. C.! It is intersting that St. Augustin "reproached" St. Jerome because he put forward, in his Vulgata, the world creation date to 4000 b. C., instead of 5500 b. C., i. e. after the translation of the Old Testament directly from the Jewish Text instead from the Greek Text. Why does Old Testament date the age of the world creation about 4000 b. C.? Planetario 2.0 gives 4098 b. C.
VSOP87 gives 4217 b. C. between Taurus and Aries and 4038 b. C. between Taurus and Gemini. The question of the true date of the threefold conjunction J/S in Taurus will be the subject of a next paper. For the present, it is enough for us to note that the difference of 4000 years between the two threefold conjunction J/S in the constellation in which the Vernal Point was entering is about the same amount of time between the world creation and the time of the destructionof the second Jerusalem temple. It seems, I think, that Biblical writers would use this precessional time period like a calendar of the Holy Tales. But this demonstrates that the precessional phenomena were known before Hypparcus. Note that the date of the world creation in Greek biblical version LXX - i. e. 5500 b. C. - corresponds with the speed of the aequinoctial precession according to Ptolemy: 1° per century, i.e. 36" per annum, while the Jewish date 4000 b. C. corresponds to the true speed of the aequinoctial precession 50,29" per annum. It may be that Jews learnt the true speed and time of the precessional movements from Babylonians, perhaps during their captivity in Babylon during the 6th century, or that they knew them indipendently. At present, we have not enough data to realize which is the true one between the two hypotheses, but it is clear enough that precessional phenomena, times and speed had been well known since the written composition of the biblical textes, i. e. almost since the half of 1st millennium b. C., three hundred and fifty years before Hypparcus and probably remembering the heavenly tropical configuratios of 4th-3rd millenniab. C. by means of verbal traditions. To calculate each astronomical event I used the aequatorial coordinates R.A. and D., the FK4 system, Smithsonian Astronomical Observatory star data 1950, and the Newcomb's algorithms according to J.Meeus 1990 pp. 61-73. 1) the year in which the first and/or the last star of the appropriate Zodiacal constellation reached R.A. 0°00'00". I mean "first and/or last" star according to the Ptolemy's Alamgest Star Catalogue (Taliaferro 1980), which is the oldest one we have. Please note that Ptolemy divided the stars of each constellation into "formatae" (which means: forming the constellation figure) and "informatae" (which means: out the figure but inside boundaries of the constellations). 2) every time it is possible, the year in which the Vernal Point was in straight line with the first or last two stars of each zodiacal constellation. I did not tranform aequatorial into eccliptical coordinates: this calculation and some other arguments will be discussed in a further paper. 4) the biblical date of Moses birth coincides with the entry of Vernal Point in the figure of Aries. All the deeds of Israelite People - since Abraham to Maccabees - took place in Aries Age. 5) Maccabees' rebellion - like many other ones of the 2nd century b. C. in all the Mediterranean basin (Bianchi, Codebò, Veneziano 2005; Bianchi, Codebò 2005) - took place when the Vernal Point leaves Aries and set out for Pisces, giving hope of a new age of peace and liberty. Some outstanding examples of these hopes were the rebellion of the Heliopolitans in Pergamum (half of 2nd century b. C.), whose name means Sun Citizens, and the Roman Servile Wars (1st century b.C.). The end of these hopes coincided with the two Jewish Wars (66-70 and 133-135 A.D.). constellations which were written in the 1st millennium b. C., including the twelve zodiacal constellation listed according to the usual sequence and not starting with Aries but with Leo (the one) and Virgo (the other). He writes that he cannot understand the reason of this anomalous beginning. It is possible and reasonable to guess that these two "zodiacs" are the witness of very old traditions when the Vernal Point - i. e. the beginning of Spring - was in Leo (10th and 9th millennia b. C.) and in Virgo (12th and 11th millennia b. C.): they might be witnesses of prehystoric traditions verbally transmitted across hundreds of generations. It is interesting to consider that, according to the Avestic teology, Ahura Mazda created the world for a cycle of 12000 years and that at end of this cycle, during which the Evil (whose name is Angra Mainyu) would become stronger and stronger - a Saosyant (which means Saviour) will bear and lead the people of Ahura Mazda across the final judgement. In a previous paper of us, we maintained that the Magi travelled to Betlehem not looking for the Jewish Messiah but for the Mazdaic Saosyant and that one of the marks of Saosyant's birth was the entry of the Autumnal Point in Virgo just at the end of the 1st millennium b. C., precisely on 15 b. C. - another one being the threefold conjunction J/S in the same constellation in which the Aequinoctial Points were entering, i.e. into Pisces - (Bianchi, Codebò, Veneziano 2005): 12000 years before the age of Magi the Vernal Point was in Virgo. Therefore I suggest that the cycle of the Ahura Mazda's creation is pucntuated by the shifting of aequinoctial points from Virgo to Virgo on half precessional period. The name of Spica (Alfa Virginis) may derive from the position of Summer Solstice in Virgo during the 6th and 5th millennia b. C., just when agriculture spread over the Old Continent. As everybody knows, the kernel of the mithes of Mithras is the killing of the bull. But there are many other symbols in his mithology, often represented in his monuments too. Among these symbols the Bull, the Lion, the Jug, the Snake may have an astronomical meaning: if we identify the Jug with Aquarius and the Snake with Ophiucus, which is near Scorpio, we get the four tropical constellations of 4th and 3rd millennia b. C.
In Avesta, the Holy Book of Zoroasterian religion, is a yazata, the spirits faithful to the sole god Ahura Mazda. As Zoroaster, according to the opinion of contemporary experts, lived during the 9th - 8th century b. C. or even during the second half of the 2nd millennium b. C. (Alberti 2004) and reformed the ancient polytheistical Aryan religion in a monotheistic way transforming the old polytheistic gods into spirits subordinate to the sole god Ahura Mazda, we can assume Mithra was originally a god of the ancient Aryan pantheon - perhaps the god of the sun - and that these four symbols stood for the tropical positions of Mithra/Sun during this polytheistic period foregoing Zoroaster's reform. It is a widespread conviction that Hypparcus calculated the speed of the aequinoctial precession to be 1° per century, i.e. 36" per year, but a careful reading Ptolemy's Almagest, chapter 7th, § 2, expecially in old Greek (Heiberg 1903), shows that this is not true. 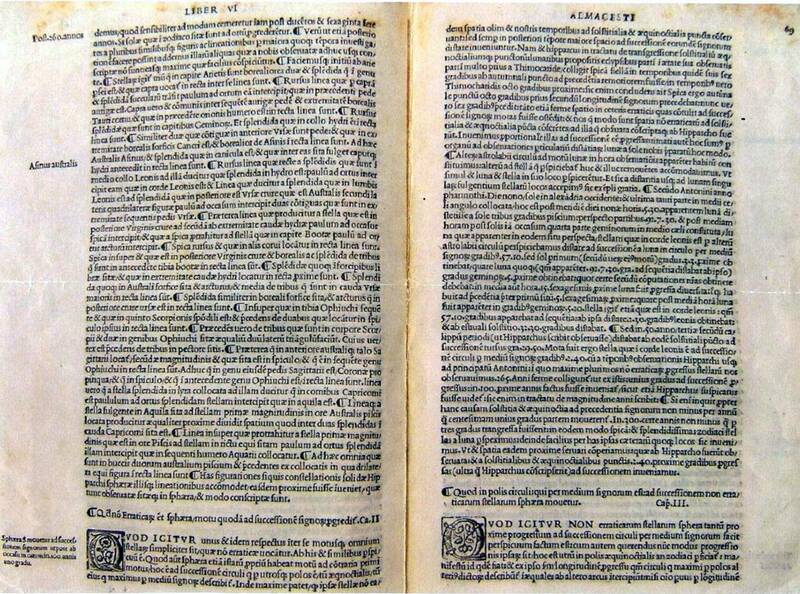 Hypparcus's books are lost and his thought was transmitted to us by Ptolemy in his Almagest. In chapter 7th, § 2, whose title is "That the sphere of the fixed stars makes a movement eastward on the ecliptic", Ptolemy, debating about the aequinoctial precession, quotes a sentence from Hypparcus's lost book On the magnitude of solar year: <If for this cause the tropics and equinoxes shifted westerward not less than 1/100° in a year, than they would have to shift not less than 3° in 300 years> (Taliaferro 1980, p. 227). The original Greek sentence is: <Ει̉ γὰρ παρὰ ταύτην τὴν αι̉τίαν αί τε τροπαὶ καὶ ι̉σεμηρίαι μετέβαινον ει̉ς τὰ προηγούμενα τω̃ν ζω̣δίων ε̉ν τω̣̃ ε̉νιαυτω̣̃ μὴ ελασσον η εκατοστον μιας μοιρας, εδει ε̉ν τοι̃ς τριακοσίοις ετεσιν μη ελασσον η γ¯ μοίρας αυτα μεταβεβηκεναι>. The same sentence (picture 1) in Latin is: <Si enim - inquit - propter hanc causam solstitia & aequinoctia ad precedentia signorum non minus per annum quam centesimam unius gradus partem mouerent. In 300 certe annis non minus quam per tres gradus transgressa fuissent> (Ptolemaeus 1528). The meaning of the sentence is clear: Hypparcus does not says that the speed of the aequinoctial precession is 1° per century, but that it is not less than 1° per century, which may mean that it is more than 1° per century, as it is in reality. The conclusion that the speed of the aequinoctial precession is 1° per century is by Ptolemy which, few lines above, writes: <And so from this it is found that there is an eastward shift of 1° in very nearly 100 years, as Hypparcus seems to have guessed when he says his treatise On the Magnitude of the Solar Year: <If for this cause the tropics and equinoxes shifted westerward not less than 1/100° in a year, than they would [sic!] have to shift not less than 3° in 300 years> (Taliaferro 1980, p. 227). Therefore, Ptolemy distorted Hypparcus's thought and this is not his only mistake. Otto Neugebauer had already noticed (Neugebauer 1974, p. 232), that according to Ptolemy's theory, the Moon apparent diameter must change of about half size; that does not happen. Neugebauer concludes that it was impossible that Ptolemy did not realize this inconsistency and that his model was kept only because it allowed <...to forecast properly the longitudes at least>. More recently, in one of his papers issued on Archive for History of Exact Sciences astronomer Dennis Duke says that using the Almagest position data of Mars, Jupiter and Saturn and Ptolemy's algorithms one gets new positions of these three planets which are very different from the new ones of the Almagest. And because Ptolemy was an expert mathematician, Dukes comes to the conclusion that Ptolemy "forced" results and theory by his authority (Codegoni 2004, p. 117). Which is about the same conclusion of Neugebauer. Therefore we can come to the conclusion that Ptolemy was at least a suspicious witness and that his witness about Hypparcus's theories must be accepted with caution. Ptolemaeus Claudius. Almagestum seu magnae constructionis mathematicae opus…Venice, Giunta, 1528 (Genoa, Italy, Berio Municipal Library, Preservation Division, classification: C.C.99). The reasonings stated above may are not proofs but surely clues that the aequinoctial precession was known by the people of the Middle East since the IV millennium b. C. at least, if not before. According with them, Hypparcus was not the discoverer of aequinoctial precession but its first witness "in writing" only. It may be that existed two different and indipendent theories about the aequinoctial precession, as Masoretic and Greek Texts would prove (Bianchi and Codebò 2005; Bianchi, Codebò, Veneziano 2005, 2009, c.s.1), the one of Mesopotamic culture and the other of Greek culture. It maybe that the tropical configuration of the beginning of 4th millennium b.C. has been handed down to posterity by the Sumerian civilization, which developed in Mesopotamia just in that time. Surely the wrong amount of 1° per century of the aequinoctial precession speed cannot be ascribed to Hypparcus but to Ptolemy, who showed himself an untrusting witness. I wish to thank: Ettore Bianchi and Giuseppe Veneziano for their cultural stimuli; Stefania Della Scala for her revision of my English text; Henry De Santis for his support; Pier Paolo Ricci for his calculations; Alessandra Marini for her advice about the Almagest latin text; Giovanna Marini and Serena Massa for their advice about the Mithra’s religion; the Genoa State Library and the Berio Municipal Library of Genoa with their staffs. AA.VV., Encyclopaedia Juadaica, Keter Publishing House, Jerusalem, Israel 1971-1972. AA.VV., Tutta la Scrittura è ispirata da Dio e utile, Congregazione Crisitiana dei Testimoni di Geova, Rome, Italy, 1991. AA.VV., Pentateuco e Haftaroth, Marietti, Tourin, Italy, 1976. Alberti A., (a cura di…), Avesta, UTET, Tourin, Italy 2004. Amadasi Guzzo M. G. & Castellani V., La "Coppa Foroughi": un atlante celeste del I millennio a. C., Giornale di Astronomia 31, n. 1, march 2005a, Italy. Amadasi Guzzo M. G. & Castellani V., La "Coppa Foroughi": un atlante celeste del I millennio a. C., Rivista Italiana di Archeoastronomia, IV, 2005b, Italy. Bianchi E., Codebò M., Considerazioni astronomiche sulle aspettative messianiche giudaico-cristiane, Atti del VIII Seminario A.L.S.S.A. di Archeoastronomia, Genoa, Italy 2005a. Bianchi E. Codebò M., Veneziano G., Ipotesi astronomica sulla stella di Betlemme e sulle aspettative escatologiche coeve nel mondo mediterraneo, Atti del V Convegno Nazionale S.I.A. di Archeoastronomia, Astronomia antica e culturale e Astronomia storica, Milan, Italy 2005b. Bianchi E., Codebò M., Veneziano G., Tempo della creazione e ciclo precessionale nella Bibbia, in: Atti del VII Convegno Nazionale S.I.A., Rome, i.p., Italy. Bianchi E., Codebò M., Veneziano G., Tempo della creazione e ciclo precessionale nella Bibbia, in: Atti del X Seminario A.L.S.S.A. di Archeoastronomia, Genoa, Italy 2009. Codegoni A., Quell'imbroglione di Claudio Tolomeo, Le Scienze, 436, dicembre 2004. Eisenman R.H. and Wise M., I manoscritti segreti di Qumran, ed.PiEmme, Casale Monferrato (AL), Italy 2006. Elliger K. & Rudolph W., Biblia Hebraica Stuttgartensia, Deutsche Bibelgesellschaft Stuttgart, Stuttgart, Germany, 1967-1977. Heiberg L. J., Syntaxis Mathematica, B. G. Teubner, Lipsia, Germany 1903. Meeus J., Astronomia con il computer, Hoepli, Milano, Italy 1990. Neugebauer O., Le scienze esatte nell'antichità, Feltrinelli, Milan, Italy 1974. Nuova Diodati, La sacra Bibbia, Edizione La Buona Novella, Brindisi, Italy, 1991. Pettinato G. La scrittura celeste, Mondadori, Milan, Italy 1998. Ptolemaeus C., Alamgestum seu magnae constructionis mathematicae opus..., Giunta, Venice, Italy 1528 (c/o Berio Municipal Library of Genoa, Preservation Division, classification: C.C.99). Rahlfs A., Septuaginta, Deutsche Bibelstiftung Stuttgart, Stuttgart, Germany, 1935. Sacchi P., Apocrifi dell’Antico Testamento, U.T.E.T., Tourin, Italy, 1981. Taliaferro C. R., The Almagest, 23rd printing, Encyclopaedia Britannica Inc., U. K. 1980. Vattioni F., La bibbia di Gerusalemme, Centro Editoriale Dehoniano, Bologna, Italy, 1977. Weber R., Vulgata, Württenbergische Bibelanstalt Stuttgart, Stuttgart, Germany, 1969. LXX = the Greek version by the seventy translaters, 3rd century b.C. (Rahlfs 1935). CM = Creatio Mundi, i.e. “from the world creation”. This is the typical dating in the Book of Jubilees. I could not always write accents, breathings and any other alphabetic sign rightly because the PC incapacity to write Ancient Greek. For the correct writing, please read Heiberg 1903.